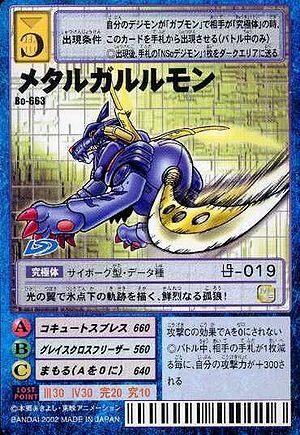 Battle Type Appearance Requirements When your Digimon is Gabumon and your opponent is an Ultimate level, make this card appear from your hand (during battle only). ◎After appearance, send one Digimon card belonging to Nightmare Soldiers from your hand to the Dark Area. A will not go to zero due to the effects of of attack C.
◎During battle, for every time the opponent's hand is depleted by one card, add 300 to your attack power. This page was last modified on 2 August 2016, at 09:25.